Hi, I had an extra GT board sitting that I had thought to be working. Just installed it and the star button doesn't work. I checked the button itself and the wiring and all seemed to be fine. Even when I found out the correct pin on the jamma it does not work. So the problem lies in the board itself, anyone know what I can do? I don't have a scope but I have a couple dead boards I could use for parts. Thanks. could also be one of the input components. you see how by all the pins there are passive components like resistors, diode and capacitors all in a line right by the JAMMA? you could have a blown component there on that input. luckily you have 20 other identical input series all around it to compare to. my bet is a stuck gate. I tried booting with dip 1 on and it booted to the test screen. 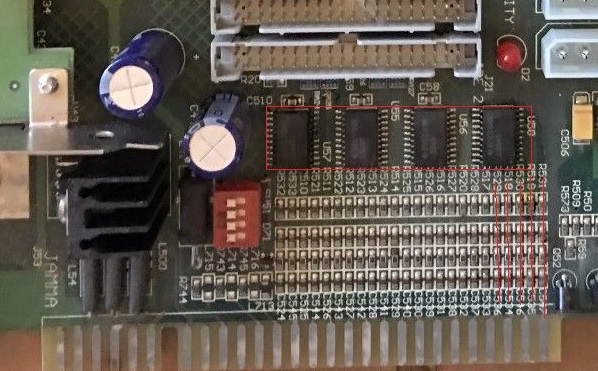 So the buffer that is closest to the start button pin on the jamma is the right buffer? So in this case u56? Now if I swap these from another board are the buffers all the same or does each one of the 4 need to go to the same spot? For example do I need to swap the u56 buffer with u56 on another board or does it matter? Thanks! BOOM you guys rock! Fixed for now! !